Every family has one. That grandma, grandpa, aunt or uncle who talks about how much harder life was back in the old days. They had to walk to school through rain, through snow or over long distances. It was dark, cold and dreary too. What they don’t seem to talk about is how they lit their way or ensured motorists could see them. Today’s families do have it easier. There are so many great options to ensure that children on their bikes or on foot can be seen and see where they are going. In an earlier post, the focus was on bike safety and the many bright and colorful options for illuminating bikes. Today we’re going to discuss road safety and personal lighting options. And, no, we’re not talking about boring reflective vests and other things that your children will leave behind in the school coat room. We’re talking about oh-so-cool and fun options that will have the other children telling their parents they want one too. They aren’t really our favorite though. Kids have to remember to bring a new glow stick with them each morning. If they have a long school day or have extracurricular activities, they might need two sticks each day (they only glow around 8-10 hours). And, they might not light up your child enough to make them easily seen. The larger, old-fashioned style glow sticks are still available but they have some of the same limitations and generally run 50 to 60 cents each. However, it might be a good idea to stash a glow stick or two in your child’s backpack as an emergency backup. That way, if your child finds themselves with dead batteries, a lost light or off their normal schedule; they will still be able to be seen. They do, however, seem to have a shelf life of 6 months; so, it might be a good idea to pack a fresh one every semester. 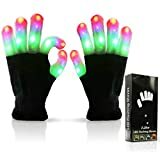 What kid wouldn’t love a pair of mittens that light up the night? A pair of CR2032 batteries and some cleverly hidden LED lights in the fingertips make these so much fun that I suspect your kids won’t lose them like last year’s mittens. Most offer several different color options and strobe settings. They are knitted, like many of the mittens we use to keep warm, so there’s an added bonus of ensuring your kid’s hands will be nice and warm on those cold winter mornings. We checked out several different options and thought these were a good choice. Luwint Flashing Finger Lighting Gloves are listed as being one-size fits all. They have six different lighting modes that are sure to make your child the coolest kid on the block. They come with the batteries and have been among the best-selling light-up toys on Amazon. We talked about headlights for bikes in our bike safety article; now, we’re going to talk about headlights for your kids. 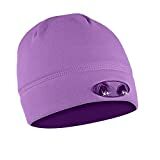 You could buy your child one of those strappy miner hat-type flashlights or you could get them a cool beenie that will also help keep them warm on cold mornings and evenings. Your child can light their path and be seen with one of these Powercaps. They include four bright LED lights which produce a light that the manufacturer claims can be seen up to 72 feet away. They are getting rave reviews and come in a large variety of colors including lavender, blue, black, olive, orange, yellow and two different camouflage styles. Another option for a lighted hat might be one of the many styles of baseball style caps that have LED lights under the brim or along the front edge of the brim. This option may require a bit of DIY, but, it's sure to be a hit with the kids - a crown of lit flowers! Originally designed to be worn at parties, this girly accessory might just make the reluctant helmet wearer excited about their safety gear. A series of ten flowers are attached to a ribbon and each flower has an LED light in the center. We’re thinking that you could velcro or sew the ribbon onto a hat or bike helmet for a really cool-looking headlight for your little ones. Unfortunately, it seems unlikely that these would be waterproof as they are party wear and not actual safety or outdoor equipment. From the why reinvent the wheel on road safety files, there’s literally thousands of mini-flashlights to choose from. Most have a single LED and yet they easily light the way along a dark path and make it easy to be seen. Almost every one of those everything’s a dollar-type stores has little keychain flashlights. I’ve used them for years. The problem with most of them is that you have to hold down the button to keep the light on; a real nuisance when lugging groceries from the car, walking a dog or carrying a backpack full of books and homework. I recently purchased a little flashlight that can be turned on and off without having to keep a button pushed down. The casing is machined aluminum and looks a bit like a miniature version of a Mag-Light. It is super tiny. It measures about only an inch long and weighs close to nothing. But, the 100,000 hour LED sure does make a bright light. It was a bit more pricy than what I had been using but the ease of use should more than make up for that. 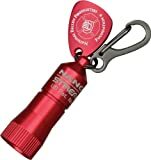 The Streamlight Nano comes in a number of colors which oddly enough can effect the price by as much as 15-20%. Their tiny size has one small drawback though. The snap hook is also very small. It will not go over my keyring but it does fit on a zipper pull; so it would probably fit nicely on a backpack's zipper or a jacket zipper. If you need to put it on something larger, maybe use a few jumprings from the arts and crafts department or a very thin zip tie. The super tiny size of these may also make them less of a target for thieves. Hanging from a backpack, they look like a small charm that could have easily come as part of the zipper. Like any safety gear, it only works if it is used. Road safety and personal lighting have one big risk factor, running out of “juice.” It may be the end of the chemical reaction that takes place in glo sticks or the end of a battery’s charge that could leave your child in the dark. Before giving them any personal lighting, make sure they understand you purchased it as a road safety device and it’s not a toy. Stash an extra glo stick or set of batteries in their backpacks so they will never be without. In the case of the tiny flashlights, you might want to buy several so you have one or more in reserve.